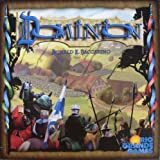 Dominion: Adventures is an expansion, and cannot be played by itself; to play with it, you need Dominion, or a standalone expansion to Dominion (e.g., Dominion: Intrigue). Those provide the Basic cards you need to play, as well as the full rules for setup and gameplay. 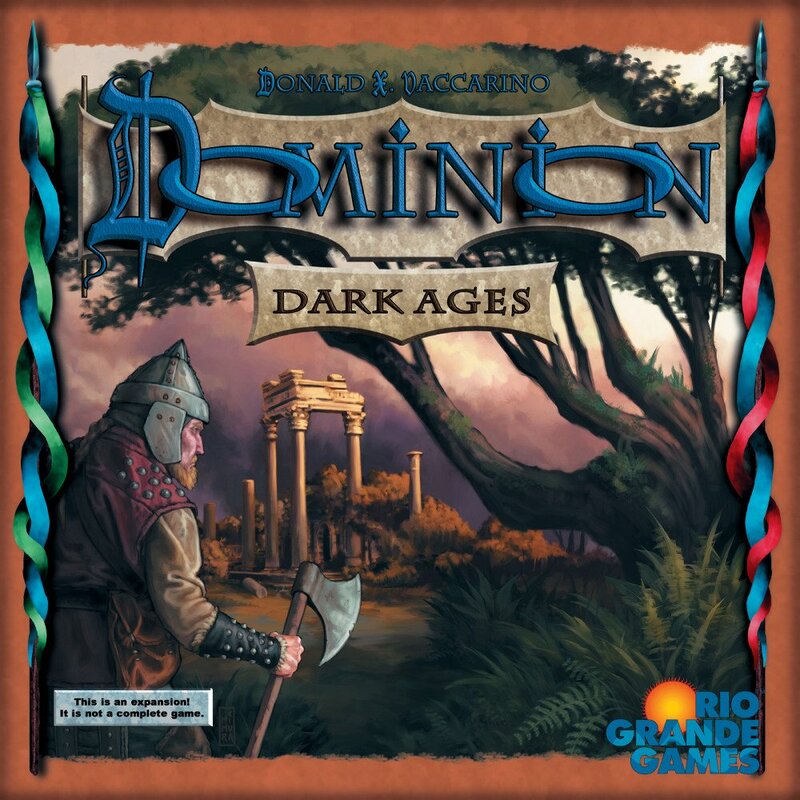 Dominion: Adventures can also be combined with any other Dominion expansions you have. 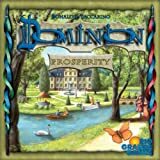 We hope you enjoy this expanding world of Dominion! Adventures includes 30 randomizer cards (one for each Kingdom card) and 20 Event cards. Players will need the Treasure cards, Victory cards, Curse cards, and Trash card from either Dominion or a standalone expansion to Dominion (e.g., Dominion: Intrigue) or Base Cards. As with previous Dominion games, players must choose 10 sets of Kingdom cards for each game. If players choose the random approach for choosing sets, they should shuffle the randomizer cards from this expansion with those of any other Dominion games they choose to play with. Event cards can also be shuffled into the randomizer deck. Events are not part of the 10 Kingdom cards used in a game; when an Event is turned over, put it on the table but keep turning over cards until you get 10 Kingdom cards. For normal play we recommend using at most two Events per game; skip any further Events. Skip Events when using a randomizer card to determine whether or not to use Platinum/Colony (from Prosperity), or Shelters (from Dark Ages) in a game. Events cannot be Young Witch's bane (from Cornucopia). If Page or Peasant is being used in a game, take the cards that they upgrade into (for Page: Treasure Hunter, Warrior, Hero, and Champion; for Peasant: Soldier, Fugitive, Disciple, and Teacher) and put them near the Supply. They can be in a single pile or multiple piles, depending on player preferences and table space. If any tokens are being used, get them out of the box and keep them handy. If any Reserve cards are being used, get out the Tavern mats and give one to each player. Adventures has 10 tokens in each of 6 player colors. These are used with some Kingdom cards and Events. Tokens are counter-limited; there is just one of each per player, and players can never have more than that. Some tokens go on Action Supply piles. When gaining a card from a pile with a token on it, just tilt the card being taken to slide the tokens back onto the pile. The tokens still function on empty piles, and may be placed on empty piles. You can track what the empty pile was with its randomizer card. Multiple tokens may be on the same pile; for example the green player might have a +1 Action and +1 Card token on a pile, while the blue player had a +1 Action token on the same pile. When multiple tokens are on a pile, they all function; the green player in that example would get both +1 Action and +1 Card when playing a card from that pile, in addition to the card's normal effects. The Trashing token (the one showing a tombstone) goes on an Action Supply pile. This token lets a player trash a card from his hand when buying a card from that pile. Trashing a card is optional and only happens when buying a card from that pile, not otherwise gaining one. This token is placed with Plan. The Journey token (the one showing a boot) is face up at the start of a game. It can be turned over by Ranger, Giant, and Pilgrimage. They turn over the token and then check to see if it is face up or not, and do something based on that. The token can be turned face down with one effect and then face up with another. The Estate token (the one showing a house) is used by Inheritance to mark the card that a player's Estates have turned into. Once Inheritance is used, the token sits on a card near a player's play area (but not in play). Four tokens give +1 of something: +1 Action, +1 Buy, +1 Card, + . These tokens go on Action Supply piles. When the player whose token it is plays a card from that pile, that player first gets the bonus. For example a player with his +1 Action token on the Ranger pile will get +1 Action every time he plays a Ranger. These tokens are used by Teacher and four Events: Lost Arts, Seaway, Pathfinding, and Training. The - cost token also goes on an Action Supply pile. It reduces the cost of cards from that pile on a particular player's turn. The - cost token lowers costs for all purposes; for example with a - cost token on Gear, a player could Transmogrify Copper into Gear. The - cost token does not lower costs below . This token is placed with Ferry. The large -1 Card token is placed onto a player's deck by Relic, Borrow, or Raid. It causes the player to draw one fewer cards the next time he draws cards, and remove the token. This will reduce a regular draw of a new hand of 5 cards to 4 cards; it will also reduce the drawing from playing Actions or other effects. The token only has that effect once; then it is removed, and the player draws normally until the next time he has the token on his deck. The token only applies to draws; it does not affect revealing cards, nor does revealing cards remove the token (reveal the cards, then replace the token). The token applies to every card that says "+Cards" or "draw" and to no other cards; except, the promotional card Envoy says "draw the rest" when it should say "put the rest into your hand;" it is not affected by the token. The token can go on an empty deck; it still applies. There is only one token per player; a player who already has the token on his deck is not further affected by being instructed to put the token there. In play - Action cards and Treasure cards played face-up to a play area are in play until they are moved somewhere else—usually until they are discarded during a Clean-up phase. Set aside cards, trashed cards, cards in the Supply, cards on Tavern mats, and cards in hands, decks, and discard piles are not in play. Reserve cards are in play once they are called; see the section on Reserve cards. Adventures includes three Treasure cards with rules on them. They are in the Supply if selected as one of the 10 Kingdom cards for the game; they are not part of the Basic Supply. They are just like normal Treasures, but have special abilities. They are played during the Buy phase like normal Treasures, and are affected by cards that refer to Treasures. A player may play his Treasure cards in any order, and may choose not to play some (or even all) of the Treasure cards he has in his hand. During the Buy phase, a player must play all of the Treasures he wishes to play before he buys anything, even if he has +Buys; he cannot play more Treasures after Buying a card or Event. When two things happen to a player at the same time, that player picks the order to do them, even if some are mandatory and some are not. For example, if a player has an Amulet in play from the previous turn, and a Guide on his Tavern mat, he could resolve Amulet and then call Guide, or could call Guide and then resolve Amulet, or could just resolve Amulet. When two things happen to different players at the same time, go in turn order, starting with the player whose turn it is. For example, when a player plays Giant, the other players are affected in turn order, which may matter if the Curses run out, for example. If a player has to do anything with his Deck (draw, reveal, set aside, look at, discard, or trash cards) and he needs more cards than are remaining in his Deck, he sets aside the rest of his Deck, shuffles his Discard pile to form a new Deck, and then does the thing with the set aside cards plus however many cards are still needed from his newly shuffled Deck. If there still are not enough cards, he does the thing with however many cards he can. If a player's Deck is empty, he does not shuffle his Discard pile until he needs to do something with cards from his Deck and cannot. Players may use multiple Reaction cards in response to a single event. Reactions are resolved one at a time. The second Reaction card can be one that was not initially in hand when the first Reaction card was used. For example, a player could play Caravan Guard in response to an Attack card and draw a Moat. He could then reveal that Moat in response to the same Attack card.